The prestigious Fashion Gallery at Snibston Discovery Park is currently hosting a brand new temporary exhibition celebrating the relationship between football and fashion. The Beautiful Game runs throughout the World Cup season and features four themed areas of display. A section titled The Dressing Room looks at the impact of fashion and technology on professional football kits in terms of design and textiles. Terrace takes a look at the clothes fans wear to matches and includes a potted history of terrace fashion including 1980s casuals. Items on display include Gabicci knitwear, Burberry from the 1990s and a CP Company jacket complete with goggles in the hood. Further on, Red Carpet explores the influence of celebrity footballers on modern menswear and the modern phenomenon of superstar sportsmen. 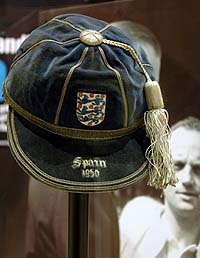 The last area, Championship, includes commemorative items and memorabilia from national and international competitions including Sir Stanley Matthews’ England cap from the 1950 World Cup in Spain. Further highlights include a Dutch shirt from a pre-World Cup friendly with England in 1982, worn by Rene Van Der Kerkof; a 1970s Derby County shirt worn by Charlie George; Richard Stearman’s current Leicester strip; and a Burton suit from the 2002 England World Cup squad. “We’re really excited about this exhibition and its connection to the World Cup, we hope that it will attract a wide range of visitors who may not normally come to the Fashion Gallery,” said gallery curator Philip Warren. The exhibition is the first opportunity for Leicestershire to show items on loan from the National Football Museum at Preston, Next, Leicester City Football Club’s Museum Collection and the Royal Lancashire Fusiliers.